Under the hashtag #NextMethodism, United Methodist pastors, theologians, and bloggers are putting forth visions of what the next iteration of Methodism will look like. While there is much disagreement among them, all participants seem to agree on an underlying assumption—current United Methodism is dying or already dead. I refuse to accept that premise. I’m sure some will dismiss me as naive or Pollyanna, but I daily encounter a United Methodism that is alive, a church through which the Spirit continues to move, speak, and change lives. My guess is that many United Methodists feel the same way, because I hear from them. They tell me how much they love their church, how they found meaning and purpose for their lives in The United Methodist Church, and how they are pursuing “universal love filling the heart and governing the life” there. 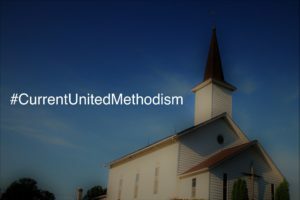 Let’s start sharing what The United Methodist Church is doing today using #CurrentUnitedMethodism. So, I think it’s time for a different conversation and a new hashtag: #CurrentUnitedMethodism. Under this hashtag, let’s share some of the great things The United Methodist Church is doing in the name of Jesus Christ all over the world, and celebrate the ways God is moving among us. #CurrentUnitedMethodism includes a member in Western Pennsylvania who told me about her church’s Save-a-Life program that trains and prepares the community for times of disaster. It also includes a congregation in Monument, Colorado that developed an Emergency Preparedness Group that among other things volunteers their time to do fire mitigation. #CurrentUnitedMethodism includes churches in Germany who decided to support refugees coming to their towns by providing for their physical and emotional needs while they are far from their homes. The same is happening in the US. #CurrentUnitedMethodism includes the car care ministry of a church in Powder Springs, Georgia that repairs cars for those who can’t afford it, by never charging for labor and donating parts when necessary. #CurrentUnitedMethodism includes the efforts of general agencies like Global Ministries and United Methodist Women who are working to conserve and protect everyone’s right to have access to safe, clean water. #CurrentUnitedMethodism taught an 11-year-old the value of fresh food, and the need for a food pantry in her community. #CurrentUnitedMethodism includes churches who give prom attire to teens who can’t afford it, send youth on mission trips, and hold dances for kids who feel left out at school. #CurrentUnitedMethodism is people praying without ceasing, making prayer shawls, being trained to visit those in the hospital, and tapping into their pain to help bring healing to another in a similar situation. #CurrentUnitedMethodism leads in movements to eradicate malaria and to work toward the abundant health of all people everywhere. #CurrentUnitedMethodism leads conversations about race in church basements, hosts AA meetings in Fellowship Halls, and loves children at Parents Day Out and nursery school programs in Sunday School rooms. #CurrentUnitedMethodism invites community children to experience the love of Jesus through the love of caring adults at VBSs and summer camps. #CurrentUnitedMethodism is Sunday School classes, small groups, and confirmation classes wrestling with theological issues, growing in faith and service, and moving on to perfection. #CurrentUnitedMethodism plants ministries that value the gifts of those with dementia. #CurrentUnitedMethodism is a kid finding his place in the adult choir, people learning guitar and drums as expressions of faith, and pastors giving everything they have for their congregations. That’s some of what I hear. What’s your #CurrentUnitedMethodism story? How do you see God at work in your church, ministry, or in your heart and life?